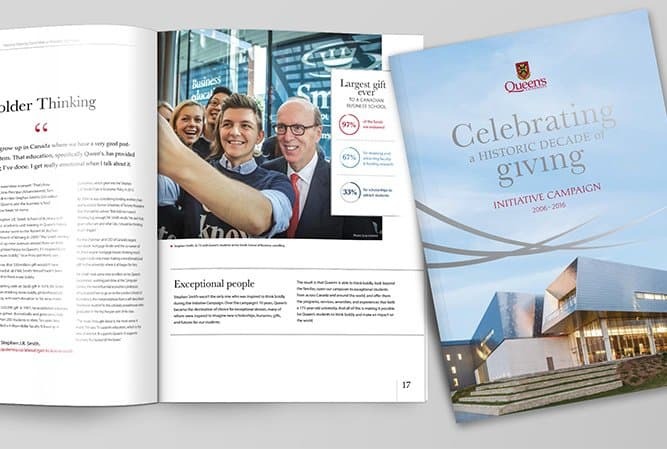 The Office of Advancement of Queen's University leads and coordinates alumni relations, communications, fundraising and stewardship. 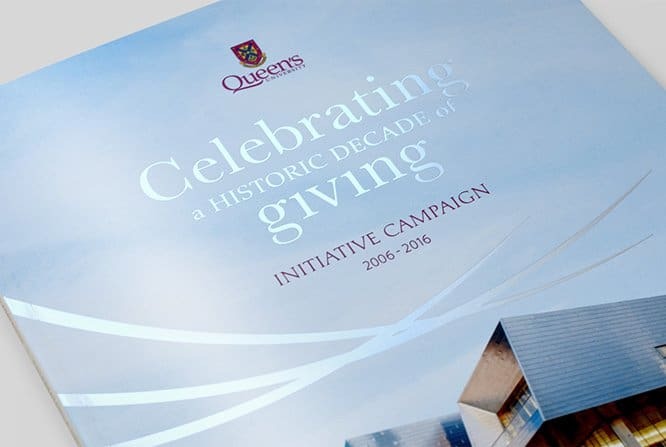 donors, more than $640 million dollars was donated through the 10-year campaign. This book needed to be the summation of stories and recognition as a gift back to donors and volunteers. 1dea set out to make a showpiece with well-crafted storytelling, creative, and printing specials that ensured this book was kept well into the future. To begin the process 1dea conducted an in-depth discovery and creative brief session with the Office of Advancement team. With the goals and objectives outlined, the 1dea design team was able storyboard the pagination and develop multiple creative concepts. 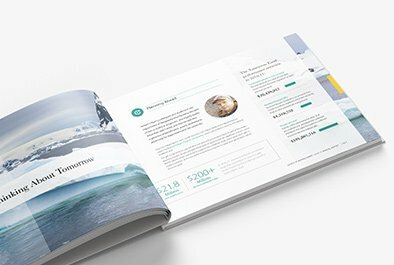 The goal for the book was an ultra clean layout with strong hierarchy distinctions and simple but impactful visuals. The specials touches were brought in with a foil inlay on the cover, perfect binding, and premium paper and printing finishes. 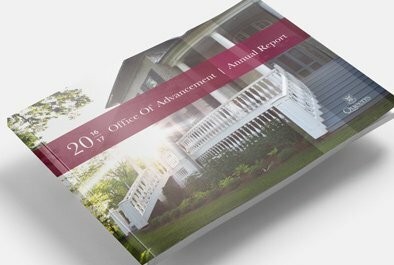 Building off the momentum of other projects, 1dea was requested to conceptualize and design the Annual Report for the Office of Advancement. 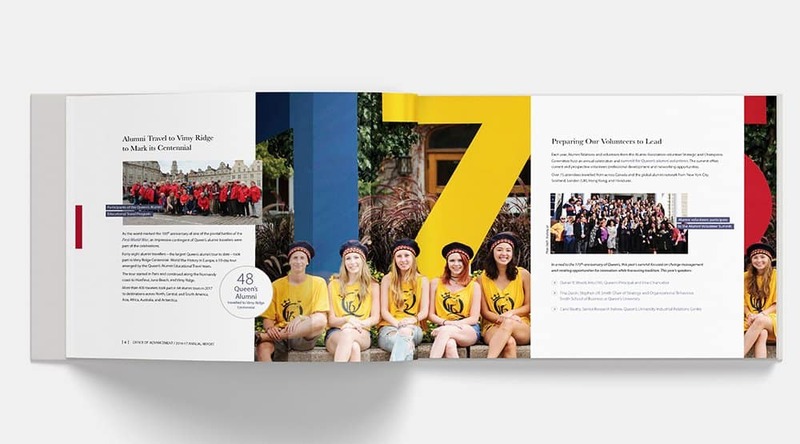 This 28-page book was made to resemble the clean and modern style of the Initiative Campaign book. 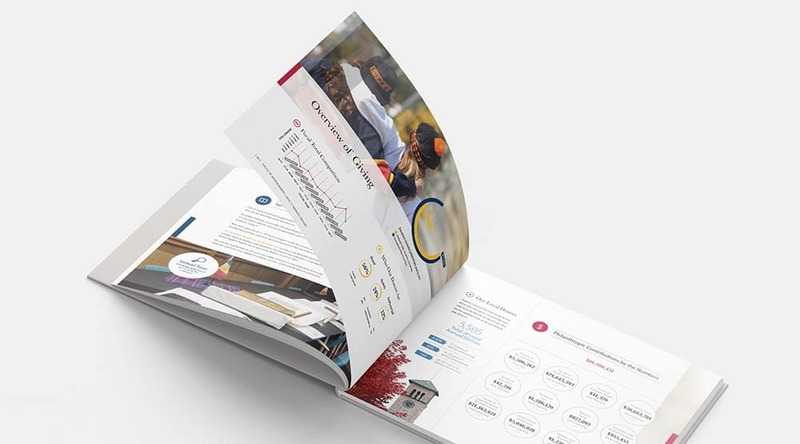 In addition, the design needed to adhere to the Queen’s University brand rules while still having a unique presence specific to the Office of Advancement. 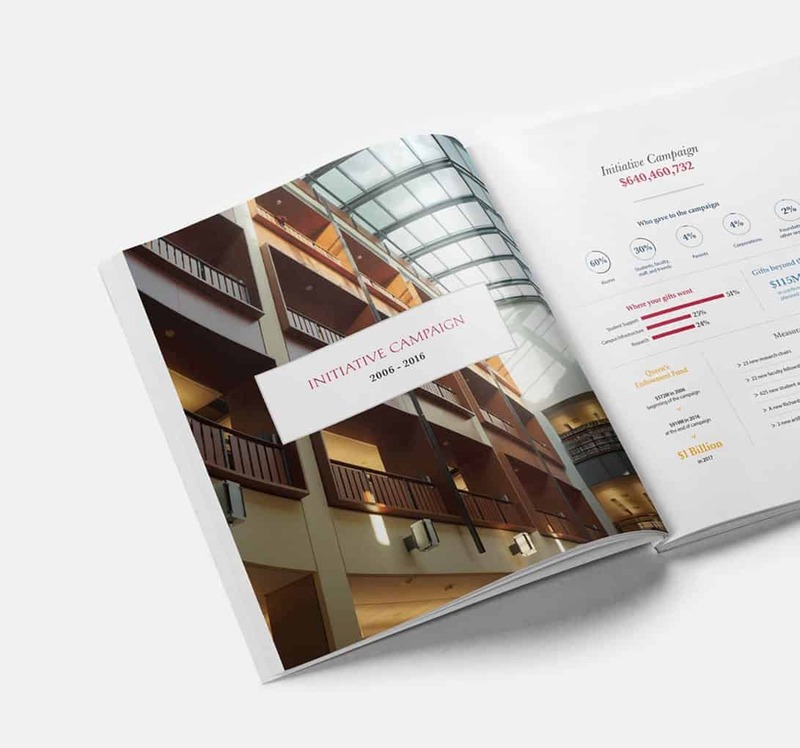 The use of bold statistics and large images gave the report an elevated finish compared to previous reports made. 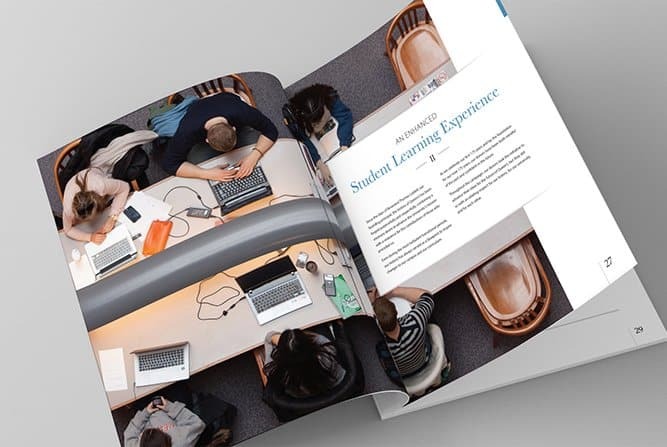 The University’s Initiative Campaign was a huge undertaking and had unparalleled success. Queen's Advancement felt 1dea was instrumental in creating a showpiece that reflected this high level of achievement. The feedback on the work 1dea developed was universally positive. 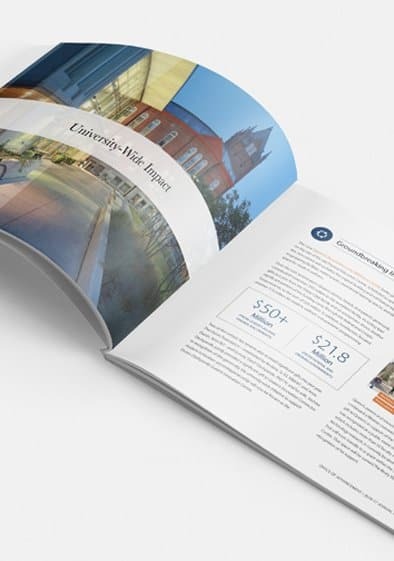 Following the launch of both Initiative Campaign book and the Annual Report, The Office of Advancement has gone on to work with 1dea on many additional projects. The partnership continues to be open and collaborative no matter what the endeavour. "It think this is the nicest marketing piece to come out of Advancement in years – truly a befitting reflection of great campaign results." Ready to discuss your growth strategy? Let's chat and see if it's a fit.